Five friends from Vancouver are starting the New Year off with one amazing goal in mind: to summit the highest mountain in the Western Hemisphere. Aconcagua, the tallest mountain outside of the Himalaya standing at 22,841ft/6,962m is a mountaineering challenge that this group is ready to take on. 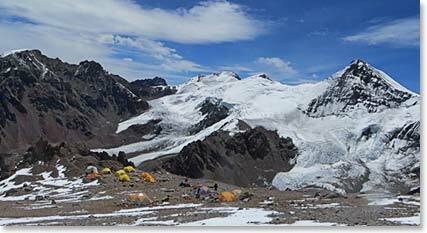 Follow along as Rob Macdonald, Elaine Thorsell, Gordon Buntain, Leah Brulotte, Doug Ross and Chuck Tattrie along with Wally, Osvaldo and the BAI Bolivian guides and staff, attempt to stand on the peak of this massive, dominating mountain. January 14, 2015 – Pancakes, Maple Syrup and Clear Skies at Plaza Canada! January 9, 2015 – Friends from Vancouver Arrive at Base Camp!